8 years ago, I published my first blog post here on $5 Dinners. We’ve come a LONG way in these past 8 years and have developed so many amazing resources and tools to help you save money on groceries. Most recently, I’ve launched the Grocery Budget Makeover and the MyFreezEasy membership program to help you create your own freezer meal plans. To celebrate the anniversary of $5 Dinners and the release of these great tools and resources, I’m throwing a SALE PARTY. TODAY ONLY, I’ve got a bundle sale going on with the MyFreezEasy membership and the Grocery Budget Makeover online class. These 2 resources and tools perfectly complement each other – in helping you save money on groceries by learning a smarter and better strategy for shopping; and in helping you streamline the time you spend in the kitchen with freezer cooking. The MyFreezEasy meal plans give you everything you need to have a successful freezer meal prep session – from how-to videos to step-by-step instructions. Like, when to open cans and what cans to drain, and what to add where and when. Seriously, very specific directions to make this FAST and easy for you! Get the Grocery Budget Makeover Discount! Upon signup for the membership and the class, you’ll get immediate access and instructions on how to build your own freezer meal plans. And you’ll get access to the Grocery Budget Makeover’s ‘pre-makeover content’ and the first lesson in the online class will begin September 6th. I’ll send you email reminders about when we begin and where/how to start the lessons, as well as more information about the freezer meal plan membership and member area. I will have our normal Grocery Budget Makeover registration period from August 27th through September 5th, but at the regular price of $49. This discount is looking pretty sweet, so I’d encourage you to sign up for both today! Again, this is a “one-day” sale….happening on August 22nd, the day that $5 Dinners began. Let’s celebrate with some savings, shall we??? 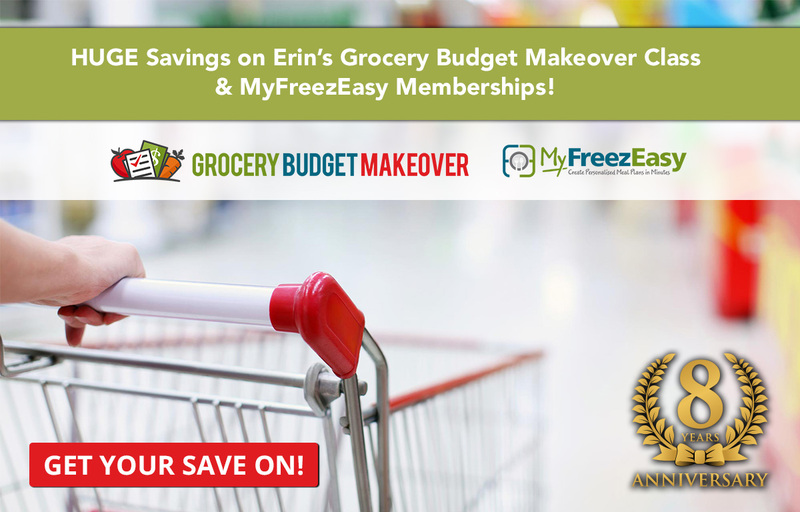 Learn more about (and sign up for) the Grocery Budget Makeover & MyFreezEasy membership here. It will be MY GOAL to help you save that $29 investment in the Grocery Budget Makeover online class within the first week or two of the class!!! And based on results from past Super Savers, I KNOW this will happen! Plus, the time and headache you’ll save with the MyFreezEasy membership is worth WAY MORE than the $10/month member fee!! !